Using evening primrose oil for acne has become increasingly popular among those, who seek natural based acne-fighting remedies. Evening primrose oil (EPO) traditionally has been used as a wound-healing and hormone-balancing remedy. But most importantly, EPO is known as an excellent manager of hormones: it balances hormones naturally. This means that it can help with hormonal imbalances which cause acne (especially adult, hormonal acne). How does evening primrose oil cure acne? Evening Primrose is rich in GLA (Gamma-Linolenic Acid). Actually, it has one of the highest concentration of GLA among other well known natural sources of this Essential Fatty Acid. For example, soy lecithin contains 45–60%of GLA, amaranth – 20–50%, pumpkin seed – 45–55%, borage oil – 40%. A concentration of GLA in evening primrose can be up to 75%? Why is GLA so important for acne treatment? GLA in evening primrose oil helps with acne, reducing inflammation of the skin and helps it retain moisture. Several studies have shown, that supplements with gamma-linolenic acid can reduce both inflammatory and non-inflammatory acne lesions. Same results were found in a study, published in the Journal of the American Academy of Dermatology. 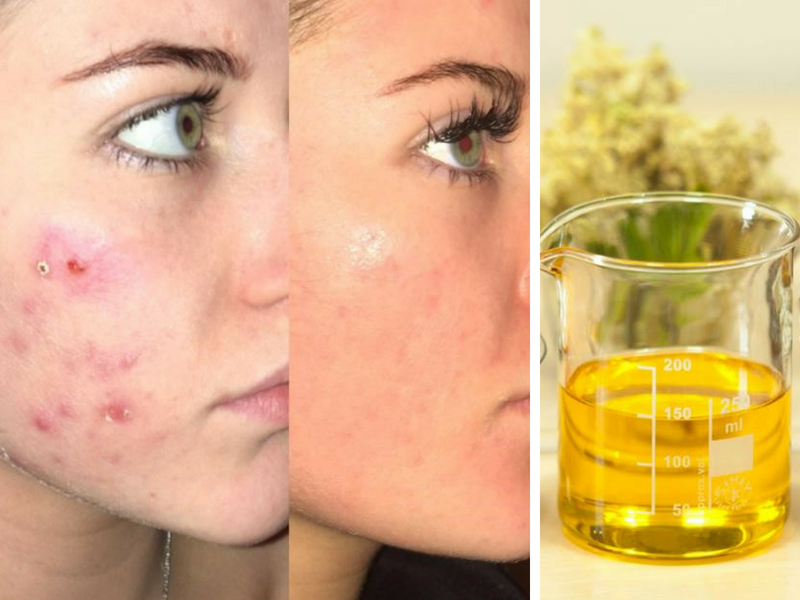 Scientists have found, that “acne patients have also been shown to have low levels of linoleic acid in their skin surface lipids”. This leads to a thicker sebum which blocks pores and breakouts. Another study made in 2014 showed that evening primrose oil can alleviate conditions such as cheilitis, inflammation and lip pain, which often occur in acne patients being treated with oral isotretinoin. (Roaccutane). The experiment lasted 8 weeks, participants received 6 450 mg capsules 3 times per day. Hormonal acne, which most commonly appears in adult women ages 20 to 40, in case if the hormone balance is offset. Evening primrose oil is known for treating hormonal imbalance in the body because it is extremely rich in omega-6 fatty acids. But are there real evidence that evening primrose oil helps with acne? As for the photo evidence, check out these “before” and “after” pictures, obtained online from real users of EPO. How to take evening primrose oil to treat acne? There two most common ways to take EPO for acne – either to apply it topically on your skin or to take it internally in a form of a supplement. Apply 2-3 drops of the oil to your face every day just before going to bed. Rub a small amount of EPO after washing your face, do not avoid areas with pimples and breakouts, because it is safe to apply EPO on the breakouts. Evening primrose oil is quite thick and has a strong smell, that is why applying it in the morning can lead to an unpleasant shiny appearance of the skin. Taking evening primrose oil in a form of supplements has a strong healing effect, as it helps to cure inflammation and hormonal disbalance problems internally. The dosage of evening primrose oil for acne. Take one evening primrose oil capsule (500mg) twice a day, 1 in the morning and 1 at night, to supplement your body with the nutrients to clear up acne. You can increase the dosage of evening primrose oil for acne treatment up to 1300 mg per day. In this case, you might want to buy more potent capsules and you would only need one capsule per day. In some cases, the dose could be increased up to 3 softgels of 1000 mg each per day (no more than 3000 mg in total). Usually, it takes about four weeks of continuous use of EPO to see a noticeable improvement in acne spots. This time, however, varies depending on the severity of the breakout and it is also possible that you see positive results sooner than that.